by Penina Adelman, Ali Feldman, and others. Jewish Lights Publishing, 2005. “Growing up is tough enough for all girls. I think a book like this can make the teenage years less stressful.” -Ariela, teen member of the Consultant Team for the JGirl’s Guide. What does it mean to become a Jewish woman? How does being Jewish support and enrich a young woman’s journey into adulthood? 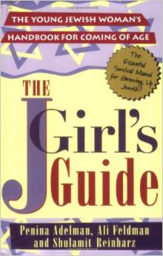 With thoughtfully selected voices from scripture, tradition and women past and present, including the authors, the JGirl’s Guide addresses the challenges of adolescence with humor, wisdom and joy. Each chapter features an issue and guiding mitzvah or commandment. For example, the chapter on “Getting Involved” uses the mitzvah, tikkun olam, (‘repair the world’) as a starting point for reflection and action. This engaging resource is addressed to Jewish teens for use individually, in small groups or mother-daughter pairs. It can also serve seekers as a practical introduction to Jewish life and faith.